Actual rating: 3.5(This review was originally posted at My Library in the Making. 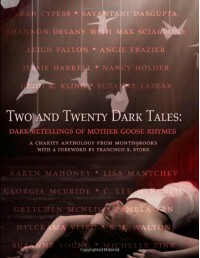 )Two and Twenty Dark Tales is probably the best title ever because it tells exactly what the book is. And although I didn't grow up to Mother Goose rhymes - except for Jack and Jill because, seriously, what kid hasn't even heard of it? - I really enjoyed this dark take on them. But before I get to specifics, let me tell you my three favorites from these twenty-two tales of awesome: Blue - Sayantani DasGuptaLyrical and hauntingly beautiful but frustratingly short, this one is about a girl who inks stories into people's skin (or at least that's what I understood she was). She, and everyone else like her, aren't invisible to humans, but they are supposed to be, that's why they come to them only while they are sleeping. Most of the other reviews I've read listed this as one of their least favorites, but I really loved it.One for Sorrow - Karen MahoneyThis one made me gasp twice or thrice. The romance may seem a little insta-love-ish but it's a short story so that was fine for me - more than fine, actually, because in just a few pages, the author already made me root for the couple. Talk about skill.And perhaps my most favorite: The Wish - Suzanne YoungWhile reading, I often write down notes or phrases to include in my reviews, and here's what I wrote for this one: "Grabbed my heart and shattered it against a wall". Yep.But as with all things, short stories could disappoint. Some of the ones in this collection dived into the action too early, ending up being confusing, which was such a shame because even those were so creative and imaginative and new. Anyway, I really savored the well-done ones; some of which - including my favorites I listed above, of course - were so good, I couldn't help but wish they'd be turned to full-length books.Which brings me to the main downfall (not really) of this anthology: it's an anthology. I should've known I'd be left hungry for more, but I have no regrets, and if I'd read this back when I was more of a scaredy cat than I am now, I might've slept between my parents for weeks. Also, I added this title to my "buy and read again" shelf on Goodreads because a few stories (an extended version of C. Lee McKenzie's Sea of Dew and Nancy Holder's The Lion and The Unicorn: Part the Second, if anything else) can only be found in the finished copy.MY FAVORITE PART was Michelle Zink's A Ribbon of Blue (not a fave of mine, yes, but still! ), which was as close to a happy tale as this book would allow.